Youngster David Ferguson has today joined Championship side Alloa Atheltic on loan until the end of the season. Ferguson, 19, has been a mainstay for Jonatan Johansson’s Under 20s side this campaign and made his first-team debut against Dundee Utd at Tannadice last August. He has subsequently gone on to play top team football on six separate occasions, including three starts against Inverness, Ross County and St Mirren. Comfortable across the back four and in midfield, he will look to help Paddy Connolly’s men as they battle with Cowdenbeath and Livingston at the foot of the Championship table. ‘Well boss Ian Baraclough said: “David has performed really well in recent matches for the Under 20s, but with Louis Laing, Stephen McManus, Simon Ramsden, Mark O’Brien, Fraser Kerr, Josh Law and Luke Watt all battling for a spot in a similar position, it’s been difficult for him to get in. “However, playing in the Championship with Alloa will benefit him enormously, particularly being in a first-team when the pressure is on, as opposed to playing Development League football every Tuesday. A youthful Motherwell Under 20s conceded twice in the last fifteen minutes to lose 2-1 to Partick Thistle this morning. The Steelmen had gone in front courtesy of Dylan Mackin’s tenth goal of the campaign, but Jordan Leyden levelled from the penalty spot after seventy-five minutes. Then, with just three minutes remaining, Michael McMullin tucked home from close range after some neat built-up play to win all three points for his side. Jonatan Johansson made as many as eight changes to the team that beat Dundee Utd on Tuesday and named his youngest ever side at this level. Included in the squad were six players still eligible for the Academy U17s side, with the average age of the squad just 17.1 years, goalkeeper Ross Stewart the most experienced at 19-years old. Thistle themselves had a young team too and it told, with both sides a little naive at times, but with plenty of effort and endeavour during the first period. So much so, after 30 minutes there had been just one effort at goal, and that’s when Leyden robbed 16-year old Barry Maguire and charged in on Stewart, only to scoop his effort over the crossbar. Motherwell’s first effort of the game came from Liam Anderson, who broke the lines to get on the end of a Danny McNulty throughball, only for his low shot to be comfortably held by Conner Cullen. Leyden had a thirty-yard effort sail over and McMullin perhaps could’ve done better with a back post header as Thistle looked to get ahead, but nothing that caused Stewart many problems. Down the other end, the Fir Parkers were equally shy in front of goal, with a Robbie Leitch shot that fizzed wide the only noteworthy effort in an otherwise tame first half. However, Johansson’s men came out the traps after the restart and the former Charlton striker would’ve been scratching his head at how his team didn’t take the lead after just 45 seconds. Anderson capitalised on some hesitant defending before smashing a shot that Cullen blocked. It fell back out to the winger, but his second shot was saved again. When it landed at Robbie Leitch, a goal looked certain but his shot was saved again, before being hooked off the line by Matthew McInally. Mackin spurned two free headers inside the penalty box before eventually grabbing the goal he and Motherwell deserved. Luke Watt, who was the best player on the park, was the creator, sending a lovely long diagonal pass towards the striker, who held off his marker before slotting past Cullen. After their goal the Claret and Amber men continued to create, albeit Thistle were having more of the ball. Mackin curled a shot high and wide of target and Higgins smashed a shot over from the edge of the box and you felt a second goal would be enough to secure the victory. However, somewhat against the run of play at the time, the Jags drew level from the penalty spot after Craig McCall tripped McCarthy in the area. Leyden stepped up and coolly knocked the ball down the middle to level things up. ‘Well introduced a number of subs including Ryan Watters and 15-year old Dylan Falconer and it was one of those, Watters, who almost put the visitors back in front. He latched on to a loose ball inside the area, only for his low shot to deflect behind. From the resulting corner, the same player crashed a header narrowly wide of the post. However, it was the Thistle who looked the most likely after Stewart had blocked well to stop Andy McCarthy, he was left with little chance as the hosts nabbed all three points late on. It was a good flowing Jags move, that started deep in their own half, but after McLaughlin and Lamont had combined, they slipped McMullin who tucked it away from close range. It was a cruel blow for the youngsters, although with the average age of the team that finished the match just 16.8 years, there is plenty to be encouraged about with some youth products gaining valuable experience at a higher level. Come along to Fir Park this Sunday (29th March) for a fun packed day in the Centenary Suite. Open from 12.30pm, visitors will have the opportunity to visit the tunnel to see their new tiles in place in our new-look tunnel wall. For those who have not yet purchased, there will be a facility to buy yours and carve your name in history. At 2.30pm you’ll have the chance to test your knowledge in our MFC Pub Quiz, answering questions about all things Motherwell throughout the ages. For the kids, we will have FIFA15 set up and will be running a tournament all afternoon, provided by our friends from GAME. Chairman Brian McCafferty and General Manager Alan Burrows will be in attendance and at 3.30pm they will be hosting a fans’ Q&A, answering all your questions about MFC. Come 5.00pm, Scotland take on Gibraltar in EURO 2016 Qualifying action and we’ll be showing the game live and providing free pies at half-time too. The bar will be open until after the game, with free soft drinks available for kids. Extended highlights from Fir Park as Craig Moore’s first-half free-kick was enough to give the Under 20s the win over Dundee Utd. Jonatan Johansson is adamant there is room for improvement despite watching his side edge out Dundee United. The Steelmen, reduced to ten men after Ross MacLean’s 54th minute ordering off, won the game thanks to Craig Moore’s deflected free-kick. Ironically, the Fir Parkers played their best stuff when a man light, and the former 106-times capped Finnish International hitman is adamant there is more to come from his youngsters, who have only lost once since the middle of December. “You have to be pleased every time you win, particularly when you show the instinct and desire after going down to ten men, that was good,” he said. “We had a few chances in the opening minutes to counter, but began to take liberties, too busy watching each other then reacting. We played too much as individuals and our possession wasn’t good enough. “It was scrappy, we were lucky to be ahead; I wasn’t pleased with the first-half at all. There were some words at the interval, and I was satisfied with our reaction in the second half. A Craig Moore free kick shortly before the half-time interval was enough to give 10-man ‘Well a narrow win over Dundee United. It what turned out to be a fairly low-key evening, Ross MacLean was ordered off for two bookable offences after Moore had put the Steelmen in front. However, both teams failed to really trouble the opposition goalkeeper with chances few and far between. United felt they should’ve had a penalty midway through the second half when Luke Watt and Justin Johnson came together inside the area. Referee Liam Butler was having none of it though. ‘Well made two changes to the side that comfortably beat St Mirren last midweek. Mark O’Brien and David Ferguson dropped out, Jack McMillan and the returning Zaine Francis-Angol came in. ‘Well made a positive start to the game, Dom Thomas winning a corner after a good run before taking the kick himself; Craig Moore eventually heading his cross over the bar. Other than a Fraser Kerr header after 17 minutes, there was very little in the way of goalmouth action in the opening half hour. The visitors had their first effort at goal with nine minutes of the half remaining, Johnson going on a mazy run before drilling a long-range effort over the bar. However, with their next attack, Motherwell took the lead with what turned out to be the game’s winning goal. Jamie Robson was adjudged to have hauled down Craig Moore on the edge of the area. The striker dusted himself down to take the kick, only for his shot to cannon off Aaron Duke, wrong-footing the helpless Joe McGovern as the ball spun into the net. ‘Well replaced Zaine Francis-Angol at the interval – Danny McNulty was introduced and shortly after the restart, Nathan Thomas was withdrawn and replaced by Steven Higgins. In between times, Jack Leitch went close with a shot from distance that took a coat of paint off the post as it whistled past. However, with the half just nine minutes old, Ross MacLean picked up his second yellow card of the night for a cynical pull, leaving ‘Well to play over half an hour with a man light. Both sides traded shots from distance, Dom Thomas for ‘Well and Duke for the Terrors, neither of which presented the goalkeepers with much in the way of trouble. Then, on 68 minutes, United were denied what looked like a stick on penalty. Johnson charged into the area and looked a safe bet to bring his side level. He appeared to be pulled back by Luke Watt but as he hit the deck, there was nothing doing from the match official. United were incensed, their protests carrying on for several minutes. When the game got properly going again, it was much the same with both teams only really creating half chances. Moore tried an ambitious overhead kick for ‘Well whilst Euan Spark’s long-range hit ended up high and wide of goal. United’s best chance to level came with ten minutes left on the clock. A ball into the area caused problems as Ross Stewart came to punch. The ball was eventually headed towards goal by Duke, and it would have gone in, but for Moore who had got himself back onto the line to knock it over. At the other end, Thomas was denied what has become and almost customary goal for the Under 20s when his low shot hit the outside of the post and dropped wide with perhaps better options available on the cutback. There would be no further goals in what was a scrappy match by SPFL Development League standards. The Steelmen are back in action this coming Friday with an away match against Thistle, looking to keep up their excellent record in 2015. Motherwell Under 20s face three games in six days as the Development League season nears its conclusion. The young Steelmen have been on fine form since the turn of the year, losing just the once in their previous seven matches. Included in that run were thumping away wins at Kilmarnock (0-4), St Mirren (1-5) and Inverness CT (1-4), as well as respectable draws against Rangers and Hibernian. They now face three games in just six days as they look to finish the season on a high. The first is on Tuesday (24th March) when they take on Dundee United at Fir Park (6pm KO). The middle fixture is the rearranged game against Partick Thistle, postponed from mid December, which will go ahead this Friday (27th March). Although it’s an away match, it will take place at the familiar surroundings of Airdrie’s Excelsior Stadium (11am KO). The final match is next Monday (30th March) when they face Celtic at Morton’s Cappielow Park. Kick off for that game will be 7pm. Motherwell club sponsor Cash Converters is delighted to announce that Josh Law has won the Player of the Month award for February. The Steelmen played three games during February, narrowly losing to Ross County and Dundee before beating high-flying Inverness CT 2-1 at Fir Park. The Player of the Month is voted for by the ‘Well fans on Cash Converters’ official SPFL Facebook page and Josh was handed the trophy by ‘Well fans John, Jack and Harry McLean. Look out for the next vote at the end of the month to be in with a chance of presenting the award to the winner. Simply visit our Cash Converters SPL Facebook page by CLICKING HERE. Motherwell Football Club today remembers and marks the 20th anniversary of the passing of the late, great Davie Cooper. Lanarkshire-born, Davie started his career with Clydebank in 1974 and spent three successful years with the Bankies, including winning a Second Division title, before securing a £100,000 move to his boyhood heros, Rangers. Davie’s first season, under the guidance of former ‘Well boss Jock Wallace, was a successful one, as the Ibrox club secured a domestic treble. He would go on to win three league titles, three Scottish Cups and seven League Cups in a trophy-laded 12-year term with the light blues. At the same time, he also made his senior Scotland debut against Peru at Hampden in 1979 and went on to win a further 17 caps whilst with Rangers. 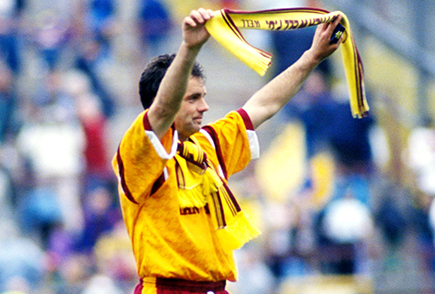 In August of 1989, Motherwell signed Cooper with former teammate Tommy McLean paying just £50,000 for his services. In his four and a half seasons at Fir Park, Coop played over 150 times for the Steelmen and helped the club win its first major trophy in 39 years: the 1991 Scottish Cup Final against Dundee United. His contribution to the club was a whole lot more than just that, though. He drove McLean’s vision forward, and helped bring on the careers of talented young players such as Phil O’Donnell. He also won four more Scotland caps whilst in Claret and Amber, but sadly missed out on Italia 90 through injury. In late 1993, Davie returned to Clydebank as a player/coach. It was whilst with the Kilbowie club that he also worked on a STV television programme called ‘Shoot’ alongside current Sky Sports pundit Charlie Nicholas and former St Mirren boss Tommy Craig. Tragically, whilst coaching kids, Davie, who was 39 years old, suffered a brain haemorrhage and died in hospital the next day. His death had Scottish football in mourning, particularly those at his three previous clubs. In tribute, Motherwell FC renamed their recently rebuilt North Stand as the Davie Cooper Stand, which still stands proudly to this day. Twenty years on, the Scotland Hall of Famer is still fondly remembered by everyone at Motherwell Football Club and on this sad anniversary, we think of his close family and friends.